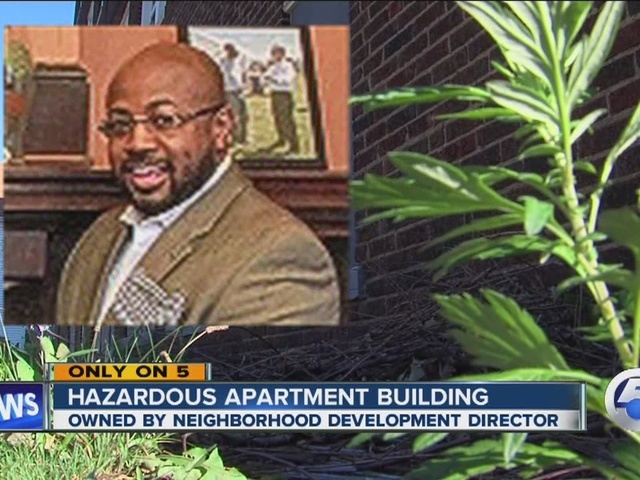 Cleveland's Union-Miles Development Director Donald Woodruff is wanted in city housing court, facing $91,000 in fines over a vacant apartment building he owns on E. 116th Street. An arrest warrant has been issued for Woodruff's Ducke Groupe Inc. in connection with the abandoned 30-unit complex that's been charged with numerous code violations. According to Cuyahoga County tax records, Woodruff also owes $88,000 in back taxes on the building, and hasn't made a payment in more than three years. Resident James Bates, who lives near the potentially hazardous building is upset that a man who is charged with improving the quality of life in the neighborhood, is allowing the situation to continue. "It's sad that you have something like that sitting on the corner of a main thoroughfare," said Bates. "Right across the street from a public school, where little kids live in this neighborhood go, and they have to see that when they go to school. I have to see it when I go to work." newsnet5.com contacted Woodruff by telephone, and he apologized to residents living near the decrepit complex. "I will appear in housing court to take care of my issue on Sept. 25," said Woodruff. "I just could get the grant money I was hoping the get, to fix-up the property, so now I plan to sell the building to a viable developer." newsnet5.com also spoke with Union-Miles Executive Director Jeanetta Price, who said she was aware of Woodruff's personal problems, and explained he needed to solve his issues to continue as an agency employee. Bates and other residents are also hoping the abandoned apartment building will be renovated or torn down in the coming months. "So you got to come out and you got to make it right, because this isn't safe for my family or the kids that are in this neighborhood," said Bates.